With upper and lower roll dispensers, ideal for holding rolls of bubble wrap or kraft paper, these long packing benches have the space, functionality and storage to make all kinds of packing operations quicker and easier than on a standard packing station. There are four sizes available for rapid UK delivery, with a load capability of up to 300kg. 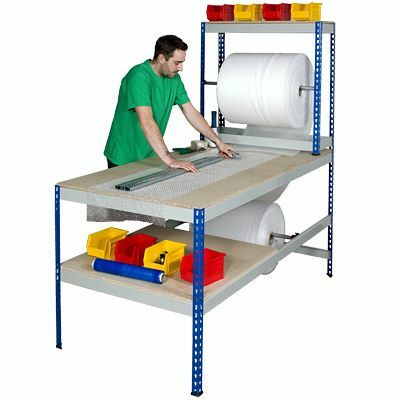 Throw in upper and lower shelving areas that will keep regularly used tools, parts and components accessible, tidy and out of the way, and you’ve got an all-round packing bench that will really speed up your packing and dispatch operations!